The Supersoul, or Paramatma, is a partial representation of the Supreme Person who oversees and sanctions all that goes on within the material world. Paramatma is within each atom and each living entity, accompanying the individual atma (soul) throughout each of our lifetimes in material bodies, and helping us fulfill our individual destinies and desires. 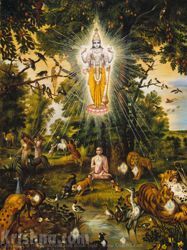 In the Thirteenth Chapter of the Bhagavad-gita, Krishna explains how He, as the Supersoul, simultaneously exists in the hearts of all beings as the well-wishing friend of everyone, the witness to all activities, the maintainer of all things, and the supreme controller within the universe. The Upanishads give an allegory explaining our relationship to the Supersoul. Two birds are sitting in a tree. One bird is anxiously eating the tree's fruits, while other bird is calmly watching him. We're the anxious bird, and the witness bird is the Supersoul, or Superself. "Every living being has his intelligence, and this intelligence, being the direction of some higher authority, is just like a father giving direction to his son. The higher authority, who is present and residing within every individual living being, is the Superself." The top painting shows how Krishna is present in every living entity. 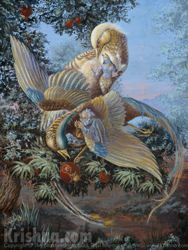 The middle painting ("Read More" view) illustrates the Upanishads' allegory of Supersoul and the individual soul as two birds. Paramatma, a way of appreciating the presence of God within everything. Temple of Vishnu, God's presence within all living bodies makes each body a temple. Reflections at the Zoo - how every species is related by common parentage and presence of Supersoul. Inklings of the Psychic Commons, how contemporary descriptions of a “collective unconscious” are strikingly similar to ancient Vedic descriptions of the Supersoul.
" Yet in this body there is another, a transcendental enjoyer, who is the Lord, the supreme proprietor, who exists as the overseer and permitter, and who is known as the Supersoul." "Both the Supersoul and the atomic soul are situated in the same heart of the living being." "I am seated in everyone's heart, and from Me come remembrance, knowledge and forgetfulness. By all the Vedas, I am to be known. Indeed, I am the compiler of Vedanta, and I am the knower of the Vedas." "The Supersoul fulﬁlls the desire of the atomic soul as one friend fulﬁlls the desire of another." "The Personality of Godhead Lord Sri Krishna is in every living being along with the individual soul. And this fact is perceived and hypothesized in our acts of seeing and taking help from the intelligence." " Everywhere are His hands and legs, His eyes, heads and faces, and He has ears everywhere. In this way the Supersoul exists, pervading everything." "O scion of Bharata, you should understand that I am also the knower in all bodies, and to understand this body and its knower is called knowledge. That is My opinion." " The Supersoul is the original source of all senses, yet He is without senses. He is unattached, although He is the maintainer of all living beings. He transcends the modes of nature, and at the same time He is the master of all the modes of material nature." "The Supreme Lord is situated in everyone's heart, O Arjuna, and is directing the wanderings of all living entities, who are seated as on a machine, made of the material energy." Since the mind gives us so much trouble, what is its real purpose?